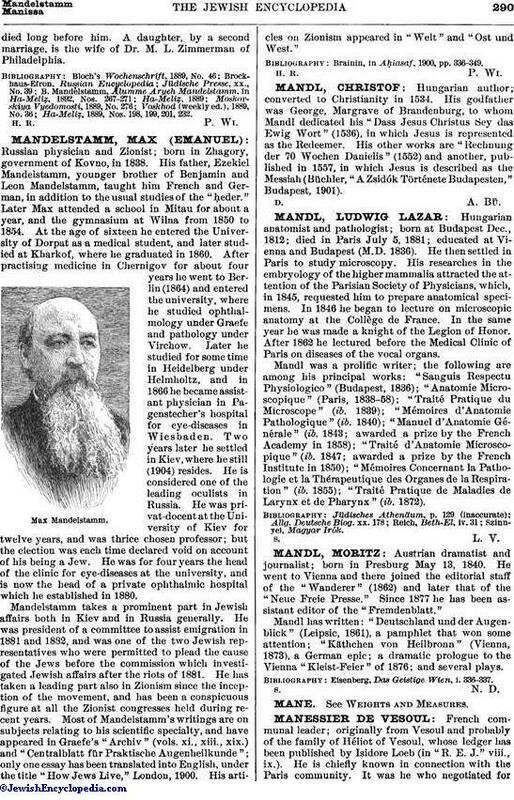 Russian physician and Zionist; born in Zhagory, government of Kovno, in 1838. His father, Ezekiel Mandelstamm, younger brother of Benjamin and Leon Mandelstamm, taught him French and German, in addition to the usual studies of the "ḥeder." Later Max attended a school in Mitau for about a year, and the gymnasium at Wilna from 1850 to 1854. At the age of sixteen he entered the University of Dorpat as a medical student, and later studied at Kharkof, where he graduated in 1860. After practising medicine in Chernigov for about four years he went to Berlin (1864) and entered the university, where he studied ophthalmology under Graefe and pathology under Virchow. Later he studied for some time in Heidelberg under Helmholtz, and in 1866 he became assistant physician in Pagenstecher's hospital for eye-diseases in Wiesbaden. Two years later he settled in Kiev, where he still (1904) resides. He is considered one of the leading oculists in Russia. He was privat-docent at the University of Kiev for twelve years, and was thrice chosen professor; but the election was each time declared void on account of his being a Jew. He was for four years the head of the clinic for eye-diseases at the university, and is now the head of a private ophthalmic hospital which he established in 1880. Mandelstamm takes a prominent part in Jewish affairs both in Kiev and in Russia generally. He was president of a committee to assist emigration in 1881 and 1882, and was one of the two Jewish representatives who were permitted to plead the cause of the Jews before the commission which investigated Jewish affairs after the riots of 1881. He has taken a leading part also in Zionism since the inception of the movement, and has been a conspicuous figure at all the Zionist congresses held during recent years. Most of Mandelstamm's writings are on subjects relating to his scientific specialty, and have appeared in Graefe's "Archiv" (vols. xi., xiii., xix.) and "Centralblatt für Praktische Augenheilkunde"; only one essay has been translated into English, under the title "How Jews Live," London, 1900. His articles on Zionism appeared in "Welt" and "Ost und West." Brainin, in Aḥiasaf, 1900, pp. 336-349.